(Photo:)Metropolitan Hilarion, head of the Russian Orthodox Church's foreign relations department, attends an interview with Reuters in Moscow May 16, 2014. Religious tensions are deepening dividing lines in Ukraine's crisis, with rival churches taking political sides and Kiev slighting the Russian Orthodox Church, Metropolitan Hilarion said on Friday. MOSCOW (Reuters) - Religious tensions are deepening dividing lines in Ukraine's crisis, with rival churches taking political sides and Kiev slighting the Russian Orthodox Church, a senior official of the Moscow-based church said on Friday. Metropolitan Hilarion, head of the Russian church's foreign relations department, said other churches had clearly lined up behind the Kiev government and he cited religious differences for its decision to refuse him entry to Ukraine last week. Hilarion told Reuters his church, which has broad support in the Russian-speaking east of Ukraine, did not take sides and wanted to play a mediating role in the crisis. But he doubted the others would see it as impartial. "This lack of sympathy, unfortunately, is mutual," he said in an interview at his office in Moscow's Danilov Monastery. The Russian church's critics certainly do not see it as neutral in the crisis. Its head, Patriarch Kirill, is close to President Vladimir Putin and has supported his drive to forge closer ties with former Soviet regions outside Russia. However, Hilarion said his church had contacts in Ukraine that the Kremlin lacked, including between Patriarch Kirill and Ukraine's acting President Oleksander Turchinov. But he said the government did not appear interested in the offer of mediation. Kiev's sensitivity to the activities of Russian church leaders was clearly on display on May 9 when Hilarion was barred entry after flying into the city of Dnipropetrovsk in eastern Ukraine to give a local bishop an award on his 75th birthday. After being detained for more than two hours, Hilarion was told he could not pass the border control and had to give the waiting bishop his award at the airport. He described this as a political decision with religious overtones. "The people who are now running Ukraine do not belong to the Russian Orthodox Church," he said, noting that acting Prime Minister Arseny Yatseniuk is a Greek Catholic and that acting President Turchinov is a Baptist. Ukraine has a chequered religious landscape. Alongside the Moscow-backed Ukrainian Orthodox Church are a breakaway Kiev-based Ukrainian Orthodox Church and another local Orthodox movement - both of them deemed schismatic by Moscow - and the Greek Catholic Church, which is linked to Rome. The Moscow-backed church is spread across Ukraine but strongest in the east, while the local Orthodox churches and the Greek Catholics are found more in the centre and west, where the Ukrainian language and national sentiment are stronger. Priests from the local Orthodox churches and especially the Greek Catholics, who follow Orthodox-style liturgies but are in communion with the Vatican, played a visible role, conducting prayers and masses, during the protests in Kiev that led to the ousting of pro-Moscow president Viktor Yanukovich in February. 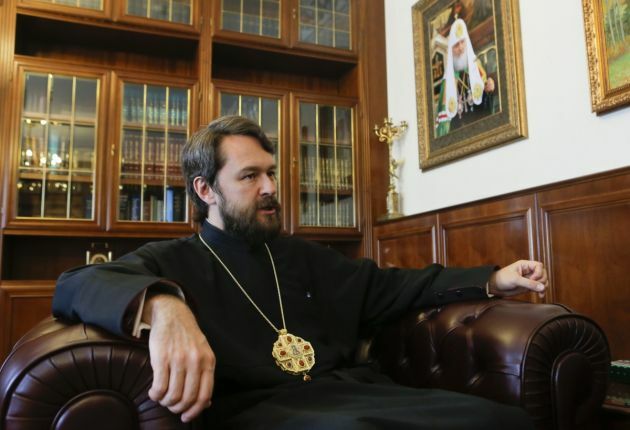 Hilarion said Ukraine's crisis was not religious in nature, but added: "The situation with religious communities in Ukraine somewhat reflects the division within the Ukrainian nation". "The Greek Catholic Church and the schismatic groups (rival Orthodox churches) have clearly identified themselves with the current regime," he said. Greek Catholics "always go against the Russian Orthodox Church" and their ultimate goal is "to subordinate all Ukrainian churches to the pope", Hilarion added. Eastern Catholic churches such as the Ukrainian Greek Catholics emerged in the 16th century. The Orthodox have long accused them of trying to win over souls for Rome. Hilarion's church issued a statement on Friday offering its services as a moderator in Ukraine's conflict, in response to a suggestion from Luxembourg Foreign Minister Jean Asselborn that religious communities play a part in seeking a solution. It echoed the tensions Hilarion mentioned, accusing other churches of exploiting "the sincere religious feelings of deeply pious Ukrainian people as a tool in a political struggle."